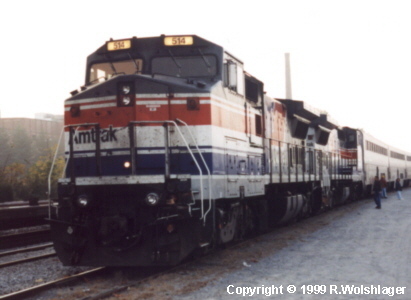 Amtrak engine #514 lead the Autumn Leaf Special seen here on 11/1/98 in Kingsport, TN The trip started out in Kingsport, TN and took you through some of Virginia's rugged country side. We departed Kingsport around 7:30 AM and headed north to arrive in Elkhorn City, KY just in time for lunch. My wife and our 2 month old son at the time enjoyed the entertainment that the city of Elkhorn City had arranged for all us Clinchfield rail fans. We spent some time visiting the Elkhorn City Railroad Museum which I finally got to visit. The trip back to Kingsport went by so fast. CSX was kind enough to hold everything for us meaning we got back to Kingsport and was able to scoot on over to my grandma's to get some good southern cooking!